Also known as the Oxford comma, it’s the one that follows the next to last item in a list. For examples we can look at newspapers, any website, and content providers. (See, in that construction, you don’t get confused about whether someone is providing content as well as websites). Print media, where I learned my practices, isn’t fond of the serial comma, because journalism is literature in a hurry. 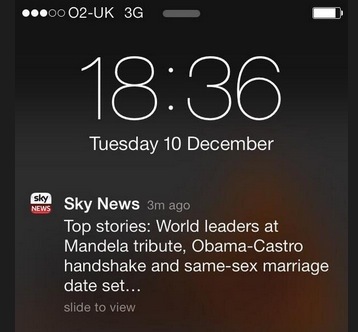 Now comes this example from Sky News (the UK version of Fox News) demonstrating the need for a serial comma. Certainly would be an interesting wedding between world political figures, though. You can read the full post here. It includes a link to Clark’s fine book. I use -ing in our Workshop as an exercise. We’re filling out the September tables now. You can be sign-ing up for a spot even now. The more you write, the more often you’ll run into the fork in the road called that versus which. That is, which do you use and in what instance? 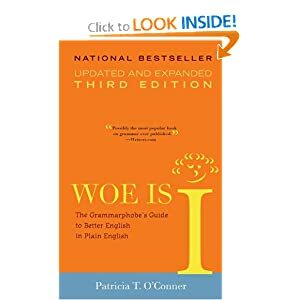 A new book in the Workshop’s library is Woe is I, one that bills itself as “the grammarphobe’s guide to English in plain English.” It’s true — and possessives are also a meaty chunk of the book — this book by Patricia T. O’Connor is written in plain English. So that’s why, which you might have guessed from the book’s scope, Woe is I delivers a ruling on That v. Which on page 2. The sentence above uses which correctly because the clause containing which can be pulled out the sentence — and we still get the point of the sentence. Not all clauses are so conveniently set off by commas, though. The clause that is bereft of commas is the one that needs that. One best way of thinking of this is, “can I get away with which here, or do I take the default of that?” That makes “which” a fast friend of the comma. Meanwhile, “that” is often the best choice in every other circumstance. O’Connor leaves us with a little epigram to sort out the distinction. Nobody wants a writer to lose their voice in the edit, but there are several things to consider in a sentence with a comma in its middle. The sentence that I just wrote is considered a loose sentence in Strunk and White’s The Elements of Style (page 25), because it’s connected with a conjunction (but) and a comma. Get enough of these in a short stretch and you run the risk of letting the reader’s focus drift. The best alternative for the comma-conjunction (such as “, and”) is to break the sentence into two, or use a stronger break such as a long dash, or a colon or semicolon. It’s a simple survey on your rewrite: just search for “, and.” Some are fine, but too many of them will give you a chance to tighten the reader’s focus. It’s easy to find praise for simple things in life. But writing seems to evoke the opposite effect in building sentences, paragraphs, sections and stories. We want to be noticed with our writing. However, if you look underneath that wish you should find the desire to be heard and remembered. Simple language delivers those two results. Simple lets the story rule the reader’s attention. Last night in our weekly Writer’s Workshop we enjoyed Blackberries, a simple short story that our member Kathleen Clark showed me over our summer break. The Leslie Norris sudden fiction story — another name for a short-short, under 1,000 words — has few sentences that run beyond 15 words. Despite the brevity, the language is rich in feeling and detail. Here’s one of the few, written about a blackberry vine. His father showed him a bramble, hard with thorns, its leaves just beginning to color into autumn, its long runners dry and brittle on the grass. Blackberries, like many other stories in Sudden Fiction International, runs on three main characters and two minor players across the space of four printed pages. The writing doesn’t shy away from using variations of the verb “to be” in various tenses. Norris considers that advice, of using better verbs than be or were, but uses these simplest verbs along with others. Much of the simplest writing does. Tonight in our workshop group meeting we talked about the use of that and which, a couple of pronouns which can baffle many a writer, regardless of their experience. A trip to the redoubtable The Elements of Style shows that the word that often stands in for which. When we talked about this, the subject drew one pun after another, making both words sound as if they were the right choices. As you can see from the cover above, this book has been an essential through many generations of writers. That is a defining pronoun: “The lawn mower that is broken is in the garage” tells us which mower. In contrast, “The lawn mower, which is broken, is in the garage,” adds a fact about the only mower in question. To put it another way, make the whiches in your writing prove their existence. Much of the time, that will serve nicely. It’s a choice which is more conversational in tone, too — and that might be closer to your native voice.